On Wednesday, Martha stopped by The Today Show and, as she regularly does, taped a cooking segment–for Big Martha’s Meatloaf. During her visit, she also spent a moment to sit with Matt Lauer for an very difficult interview. Lauer was pretty tough on Martha–but Martha was unfazed. She answered with typical aplomb, defending her company’s mission to offer products wherever customers want them. She was also characteristically diplomatic, choosing her words carefully to describe her thoughts about Macy’s CEO, Terry Lundgren. Lundgren famously hung up on Martha when she phoned to let him know about the new partnership with JC Penney. The interview was preceded by this video, a short piece covering Martha’s appearance in court the day before. According to this report, the trial could finish by Friday of this week. If it does not, it may be as late as sometime in April before the judge rules on the lawsuit. Lauer: Do you believe your products in [JC Penney] stores could help turn around that company? 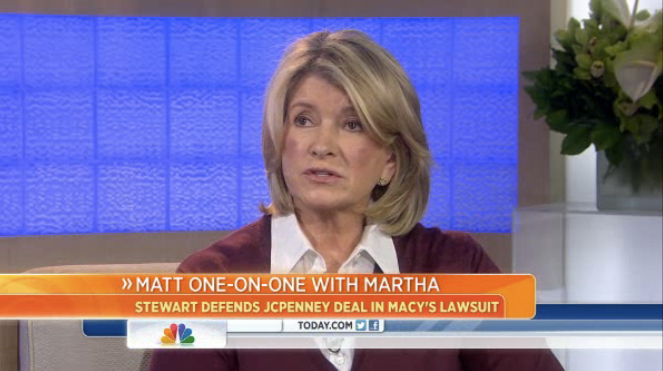 Martha: Well, as I said yesterday, [JC Penney CEO] Ron Johnson is a visionary. Ron Johnson worked very hard on all those fantastic Apple stores. He also had a lot to do with the great success of Target before that. Ron is a visionary. He is trying to reimagine the retail landscape, and that’s a big job. And he has not been given any time at all to do so. It takes a little while to rebuild something like a JC Penney; a monolith like that. Lauer: We are going to follow this story, Martha. Thank you for coming in this morning. I know it wasn’t easy for you to sit down and do this.